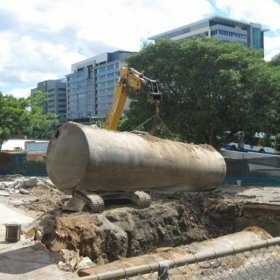 Lambert & Rehbein was commissioned by Project Services to undertake a Remediation and Validation Investigation and Groundwater Investigation (including additional limited contamination investigation) at the QFleet Garage facility located on 190 Vulture Street, South Brisbane. L&R had previously been engaged to conduct a Stage 1 – Preliminary Site Investigation (PSI) to determine the presence or absence of any TPH impacted material at the site and identified levels of contaminants above relevant trigger values to warrant the site to be listed on the Environmental Management Register. The investigation was undertaken to excavate, and where, possible remediate using landfarming techniques, the TPH impacted soil. A minor volume of soil was transported off site to a licensed landfill facility. The excavation was then validated prior to backfilling with the landfarmed material and imported clean fill material. 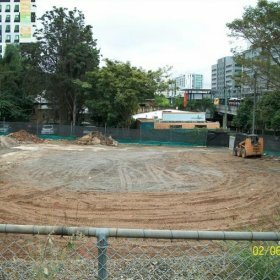 To validate the excavation and submit a Remediation/Validation report as supporting information for removal of the site from the EMR. In addition to the Remediation and Validation Report submitted to the Third Party Reviewer and DERM, L&R also prepared a Construction Environmental Management Plan, Occupational Health and Safety Plan and Contamination Management Plan prior to commencement of investigative and remedial works.